An almost completely from-scratch version of the popular Pumpkin-Gingerbread Trifle recipe. Make the Gingerbread: Preheat oven to 350 degrees F. Lightly grease a 9x13-inch baking pan; set aside. In a medium bowl, whisk together the flour, baking soda, ginger, cinnamon and salt; set aside. In a large bowl, cream together the vegetable shortening and sugar on medium speed until light and fluffy, about 2 to 3 minutes. Add the molasses and egg and beat to combine, an additional 1 to 2 minutes. Reduce the mixer speed to low and add the flour mixture to the creamed mixture in three additions, alternating with two additions of the hot water, beating well after each addition. Pour the batter into the prepared pan and bake for 25 to 30 minutes, or until a toothpick inserted near the center comes out clean. Place the pan on a wire rack and cool completely. Cut the gingerbread into &frac12-inch to 1-inch cubes; set aside. Make the Pumpkin Filling: In a large bowl, whisk the milk and instant vanilla pudding mix for 2 minutes. Let stand for an additional 2 minutes. In a medium bowl, whisk together the pumpkin, brown sugar and vanilla extract. Gently stir the pumpkin mixture into the pudding; set aside. Make the Whipped Cream: In a large bowl, beat the cream on medium speed until it begins to thicken, then add the sugar and vanilla extract. Increase the speed to medium-high and beat until stiff peaks form. Assemble the Trifle: Set aside ¼ cup of the gingerbread cubes. 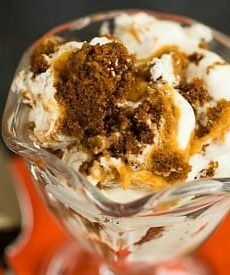 In a large trifle bowl or glass serving bowl, layer a third of the remaining gingerbread cubes, then top with a third of the pumpkin filling and a third of the whipped cream. Repeat the layers twice more. Crumble the reserved gingerbread and sprinkle over the top of the trifle. Cover and refrigerate for at least 1 hour before serving. The trifle can be stored, covered, in the refrigerator, for 3 days.